and brother to Nahor and Haran. The name Abraham means “a father of many nations.” He originally lived near the Mesopotamian city of Ur, but Terah took him, along with Lot, to the city of Haran in northwest Mesopotamia (Gen 11:31). 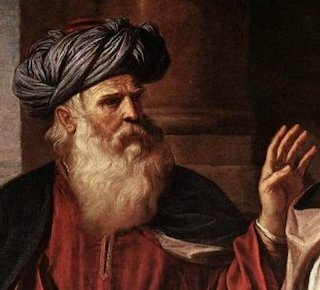 After the death of his father, God told Abraham, who was 75 years old at that time, to leave his country and to go to the land of Canaan, with his wife, Sarah, and his nephew, Lot. Lot and Abraham later separated because there was not enough grazing lands for their flocks. Abraham settled in Mamre, near Hebron. He was a peaceful herdsman but also warlike and defeated four kings who had invaded Canaan. Upon his triumphant return, Abraham was greeted by Melchizedek, the king of Salem and “Priest of the God of the Most High” (Gen 14:21-24). When Sarah could not conceive she gave Abraham her maid, Hagar, as a wife. Hagar gave birth to Ishmael (Gen 16:1-6). In affirmation of his covenant with God, Abraham circumcised himself and all males in the household. Later three angels visited Abraham and Sarah and announced that within a year Sarah would give birth. Sarah gave birth to Isaac when Abraham was 100 years old. Isaac became the sole heir, as Sarah urged Abraham to banish Hagar and Ishmael. The Lord confirmed this demand, and promised that Ishmael would also become a great nation. After Sarah’s death and Isaacs marriage to Rebekah, Abraham married Keturah, and she bore him several children. Abraham deeded everything he owned to Isaac, however he gave gifts to his other sons, and sent them off into the east, away from Isaac. Abraham died at the age of 175 and was buried by Isaac and Ishmael in a cave of Machpelah (Gen 25:9-11). Abraham’s call is the origin and mainspring of Israel’s election and religion. Abraham is mentioned 72 times in the New Testament and is considered the father of all true believers, the first to receive God’s promises. Abraham had great faith in God, and God promised to make him into a great nation, a blessing for all families of the earth, “I will bless those that bless you and curse those who curse you, and the entire world will be blessed because of you.” (Gen 12:2-3).